The Himalayas, roof of the world, is a magic place where the magnificence of the world's highest mountains is mirrored in the rugged beauty and unique culture of the people who live in their shadow. In a memorable verse of the 'Kumarsambhava', the famous Sanskrit poet Kalidasa compares the Himalaya to a gigantic measuring rod striding the earth between two oceans. The snow-capped peaks are indeed the most impressive feature. Himalaya, a Sankrit word, which means ' The Abode Of Snow' and all other names used to describe this mountain range associate it with eternal snow - "Himvan", "Himvat", "Himachal" and "Himadri". Interestingly, a vast shallow sea, the Tethys, existed where the Himalaya stands today. The submerged landmasses on either side started pushing towards each other, giving birth to these mountains. This was a relatively recent occurrence in the geographical time frame, so the Himalaya is considered a young and fragile land formation. Scientists speculate that the whole process took five to seven million years. Fossil finds at heights of over 8,000 metres (26,000 feet) support these theories. The Himalaya has risen about 2,000 metres (6,600 feet) in the past 20,000 years and continues to rise at the rate of 7.5 to 10 centimetres (3-4 inches) a year. The Himalaya is the world's mightiest mountain range. No other chain can boast of peaks of 8,000 metres (26,000 feet). In the Himalaya there are 14 such peaks and hundreds of summits over 7,000 metres (23,000 feet) high. 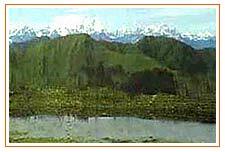 The range of mountains stretches 2,700-kms (1,700 miles) across an area between Assam and Kashmir. In the east, Namche Barwa stands sentinel; the western extremity is guarded by the awesome Nanga Parbat. The snow-capped, frost-crusted peaks have posed a challenge not only to the physical prowess of adventures; they have also inspired sublime metaphysics and lyrical poetry. There are innumerable references to this king of mountains, the glistening divinity, and the noble soul. The Himalaya is the source of many great rivers of the Indian subcontinent. The Indus or Sindhu (the river rising out of a lion's mouth) rises in the trans-Himalayan Tibetan Plateau, as does the Brahmaputra. The Ganga and Yamuna, with their countless colourful Himalayan tributaries, are inextricably intertwined with local myths and legends. For centuries, the Himalaya acted as the bulwark of Indian security, serving as the great divide between India and Tibet. The rugged terrain deterred all but the most dauntless from risking their lives on perilous journeys in the icy heights. But, difficult though many of the passes and valleys were, they did not prevent a slow penetration by determined and hardy souls for the purposes of trade and pilgrimage. It must be remembered that the Himalayan region has also served through history as a melting pot of races, religions and cultures. The vast Himalaya is far from being a homogenous region. It is, in fact, a region of remarkable variety. 'Himachal' (steadfast snows), is the term used to denote the lesser Himalaya; the outer rim rises sharply from the foothills, which are called the 'Doars', from the Sanskrit 'Dvar' (gateway). The greater Himalayas themselves are referred to as the 'Himadri'. ' Uttarakhand' is a loose, general term covering all the northern territories; it also denotes Kumaon and Garhwal as a unit. Although the Himalaya can be traced to the Arakans and Arunachal in the east, its majesty is truly encountered only when one reaches Bhutan and Sikkim. The 8,682 metre (28,483-foot)-tall Kanchenjunga overshadows all else in Sikkim. This beautiful mountain is considered sacred by Hindus and Buddhists alike and its name translates as the ' Treasure of Five Jewels'. It is the third-highest mountain in the world. The beautiful valley of Kashmir and the alpine meadows of Pahalgam and Gulmarg have been well trodden by travelers for centuries. Jehangir, the grand Mughal (also spelt as Moghul), was particularly fond of Kashmir and retired here in the summers to escape the blistering heat of the plains. He laid out beautifully landscaped gardens like the Nishat and the Shalimar in an effort to enhance the natural beauty of the land. Sikkim is situated to the south of Tibet and east of Nepal. Many of the most famous mountains in the Himalayas, including the majestic Everest, lie in Nepal. Neighbouring Bhutan also shares in the grandeur of the Himalayas. The entire country is a closed basin between two parallel and deeply intersecting transverse ridges. 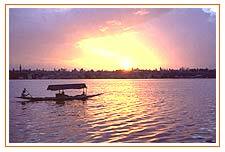 It is the catchment area of the Tista (also spelt as Teesta) River and its affluents. After travelling through Sikkim, the Tista joins river Brahmaputra. Uttaranchal lies in the central sector of the Himalaya, its boundaries marked by the Kali River in the east and the river Sutlaj in the west. Once, third of the land here consists of barren rocks, ridges and wild gorges. The 7,890-metre (25,885-feet) high Nanda Devi is the highest peak here followed by Kamet, Trishuli and the Panchachuli. Nanda Devi is the beloved Goddess of the people in Kumaon and Garhwal. Veteran mountaineers have gone into raptures over this moving sight, which has been described as 'the white-robed vision hanging from heaven which pulsates like a star with purity.' Eric Shipton and H W Tilman discovered the Nanda Devi sanctuary, and were of the view that the scenes of grandeur there were too visit for human conception. Himachal Pradesh lies further west, and Kinner Kailash in Kinnaur, is the most famous peak in this region. The Dhauladhar Range may not boast of many high peaks but it exudes a quaint charm of its own. The trans- Himalayan region proper is encountered in Ladakh, the northernmost part of the Indian Himalayas. Before the district of Kargil was carved out of it, Ladakh was the largest district of India. It is bounded to the north by the Kunlun and Karakoram mountains and to the south by the Zanskar ranges. Mountain ranges run parallel to each other in the southeast and the northwest. The famous Silk Route passed through Leh, meaning 'oasis', which is the district headquarters of present-day Ladakh. Until recently, caravans rested here before and after crossing the dangerous passes. The highest pass traversed through the Karakoram is at 5,628 metre (18,464 feet). The confluences of the Indus River and the Shyok, Zanskar, Nubra and the Drass rivers are in Ladakh. The landscape is almost lunar and the climate extremely arid. It is here that the Himalaya begins to taper down and merges into the Hindukush skirting the heartland of Asia. The Himalayan kingdom of Nepal is today's most popualar Himlayan destination in the world. Offering something special for everyone. You can easily combine wildlife safari, river rafting, a small trek to a normal tour. The distance are not too long and the possibilites are many. 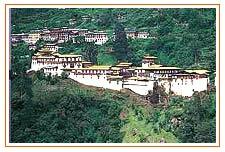 It is also possible to combine a tour to Nepal with a visit to Lahasa, or an extended over land tour to Tibet. There is no seasonal constraint on travelling in and through Nepal. Even in December and January, when the winter is at its severest, there are compensating bright sun and brilliant views. Bhutan, or the land of the Thunder Dragon, the second Himalayan kingdom is still perhaps the world's most exclusive tourist destination. An unspoiled country with majestic mountains impressed with a certrain mystique; a unique cultural heritage preserved intact and with a continuity of many centuries; an architectural style like no other; a land full of warm hearted and friendly people. Tibet is one extraordinary destination, where adventure lurks around every corner. Its name the "Roof of the World" is not a mere stetment. The valley bottoms are hiugher than the highest mountains elsewhere. Adventure on the road is never short on the beautiful Trans-Himalayan drive of over 970-kms, through the four mountain passes, promising a panoramna of a cultural and scenic diversity unsurpassable anywhere.